We have a programme in place for coach development that gives clear progression for those wishing to undertake it. this includes new potential coaches joining us as volunteers or looking at coaching as a potential career path, the progression of our participants into being young leaders then onto the coaching pathway and developing our current coaches qualifications to a higher level or into other disciplines. Alongside specific coaching courses there is a range of professional development available too which includes safeguarding, first aid, equity, engaging sessions, disability, effective communication to name but a few. Some of these are essential for all coaches and others are undertaken by choice. 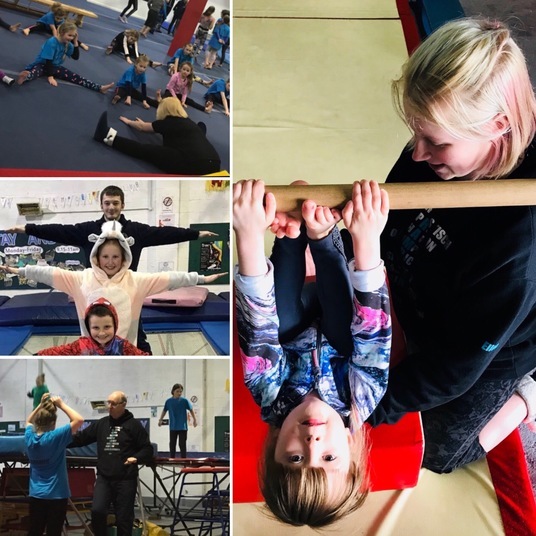 Sarah has completed her Core Proficiency course and loved this so much she has committed to doing her Level 1 Gymnastics which starts at the end of this month. Naomi and Andrew and booked to do their Rebound Therapy course at the end of this month. Michelle has completed her Rebound Therapy and is currently in the middle of her Level 1 trampolining. Joe is completing his Level 1 in Trampolining and Rachael has done her Core Proficiency too. Naomi and Ellen are booked into their Level 1 Trampolining which is taking place here at the club at the end of term. So it is looking like a busy term for all our coaches as a large part of these courses is the mentoring time that has to be completed. Colin, Ray, Fiona and Andrew will be busy bees guiding and moulding our up and coming coaches in the 'how to coach' skills, developing technical skill based knowledge and having a thorough understanding of our club's ethos.